In my opinion, Egypt consisted of nothing but a whole lot of dirty sand. 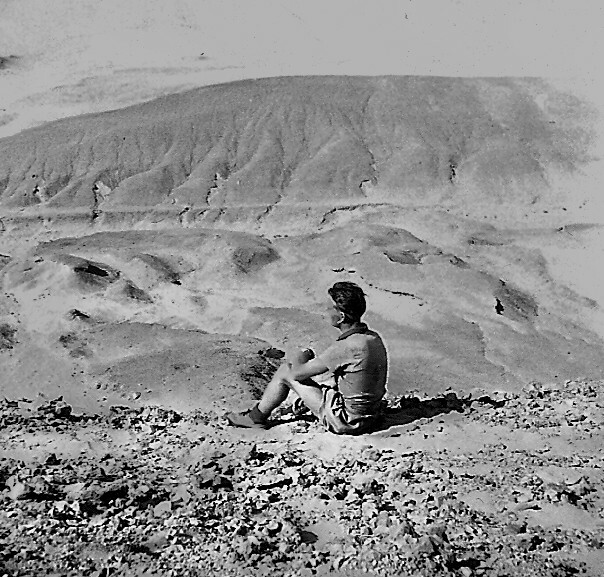 I’m looking over the sand dunes, 1951. “Hi Ian. I just happened upon your site and book title in the beginning of my search for my family history – all generated by finding a 3.5×5″ photo of my Great Grandmother immigrating to Vancouver, Canada from Aberdeen, Scotland in 1925. On the back of the photo, is written that she came (along with her husband and two small children) aboard the Montcalm freighter ship through the Suez Canal. “This is Ian’s wife, Gayle answering. Ian is 81 years old and not in the best of health, so I do most of the work on editing his yet-to-be-published books, negotiating with the publishers, publicizing and marketing and also maintain our blog at www.http://ianmooremorrans.com. You can order any of his books by going to that listed blog and being directed to the proper site for ordering. You could also take a drive north to Vernon to visit us and buy the book from us, signed by the author – your choice. The cost from us is $20 (no postage, if you pick it up). Thanks for your interest. “What a pleasant surprise your email was! It sounds like the photo you found has opened up a whole new world of discovery of your family history. I’d recommend you google the Library & Archives Canada site and then go to the passenger lists for ships arriving in Vancouver in 1925. They are on microfilm and you can access them right on the internet. “I think you’d find Ian’s memoir “From Poverty to Poverty: a Scotsman Encounters Canada” quite interesting and maybe enlightening on the period when Britain was controlling the canal. Ian was there while serving in the Royal Air Force from 1950-1953, just before the Suez Crisis when the canal was seized by the Egyptians under Nassar. There, Ian had a unique view of the tensions involved with the Brits controlling the canal in someone else’s country. He also has quite a few photos in the book connected with his time in Egypt – and a few rather wild stories! “All the best for your research on your family history. Perhaps we will have an opportunity to meet you sometime in the future. Feel free to write again if you wish. Now, if you are interested in researching your family story and if you are lucky enough to have access to photos of, letters by or documents concerning those ancestors who might have been immigrants to the country you live in, dig those photos, letters and documents out of their resting places and have a go at the internet. The quest can be quite enlightening, satisfying and addictive. Your local genealogy society is a good source of guidance as well. This entry was posted in Canadian theme, family heritage, Immigration/emigration, memoir, Ordering a book, researching family history, Scottish theme, Tracing ancestry, travel and tagged 1920s, aberdeen scotland, Egypt, family, family histories, great grandmother, military, old photos, suez canal, suez canal crisis, Suez canal travel. Bookmark the permalink. Nice post. I learn sometҺing totally new and challenging οn websites ӏ stumbleupon everyday. content from other authors and practice ѕomething from their sites.